Pop the question in style. Plan the perfect romantic proposal complete with red roses, soft music and subtle lighting. Let this gorgeous ring speak volumes about how much she is loved. Imagine the look on your sweetheart's face when you open the box to reveal this magnificent ring. Be prepared for an ''I can't believe my eyes reaction. What a beautiful ring to capture her hand and symbolize your lifelong commitment to each other. Marriage is a celebration and this ring will bring you one step closer to that ultimate journey. 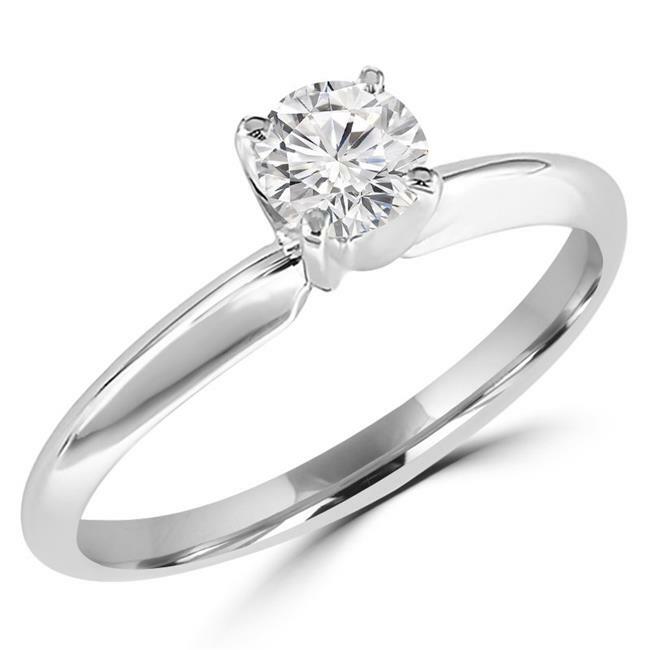 This 3/8 CT Round Diamond Solitaire Engagement Ring is luxury at its best. The diamond has a very good cut with an H-I color and SI2-I1 clarity rating. The polished 10K white gold band beautifully enhances the radiance of the diamond solitaire center. What a spectacular diamond ring to put a huge smile on your special someone.